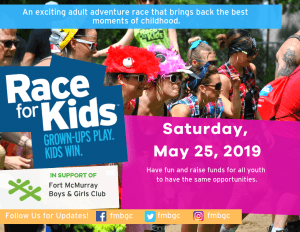 Race for Kids is an urban adventure race where teams of four compete in a race to the finish line, completing a series of 10 challenging checkpoints along the way! Challenges are designed to test the mind and body, relive the best times of your childhood and build team spirit. The Challenges and Checkpoint locations are a secret until you arrive on Race Day! Following the completion of the race, there will be a celebration BBQ with prizes awarded to the TOP Fundraising individual, winning team, and best dressed. 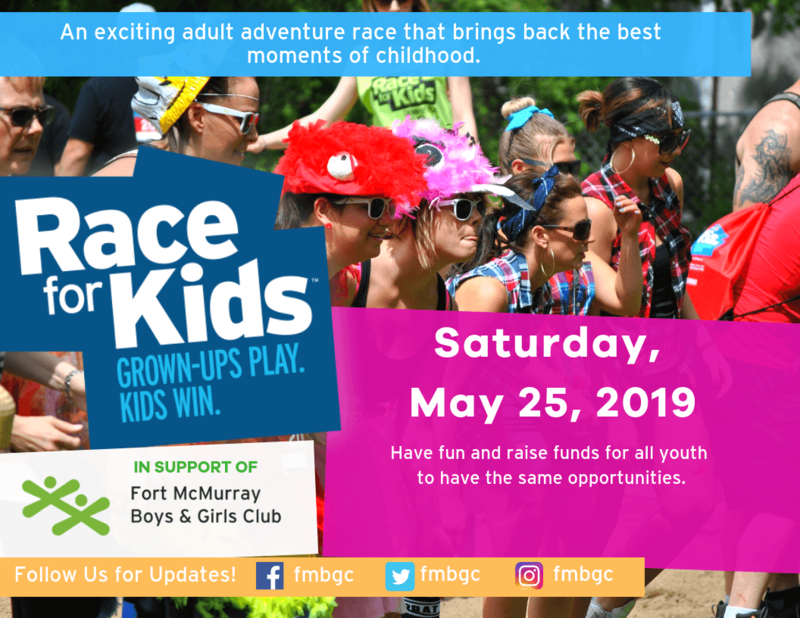 Race starts & ends at the Fort McMurray Boys & Girls Club on 20 Riedel Street. We rely on the generous support of our donors and sponsors to continue to grow our programs, and encouraging child and youth development. The funds raised from this event will directly benefit local children and youth from the crucial ages of 5-18 years old (up to 21 years old in our inclusive programs). Head Start Advantage Card will be presented to all teams who raise over $1,000! One minute for $1,000, two minutes for $1,500, 3 minutes for $2,000, and so on. Click here to download our sponsorship options. Click here to download the Participant Pledge Form. Fill out the form below to SPONSOR or SIGN UP for this event! Once we receive your information, we will be in touch with you with more details. Once we receive your information, we will get in touch with you with more details.